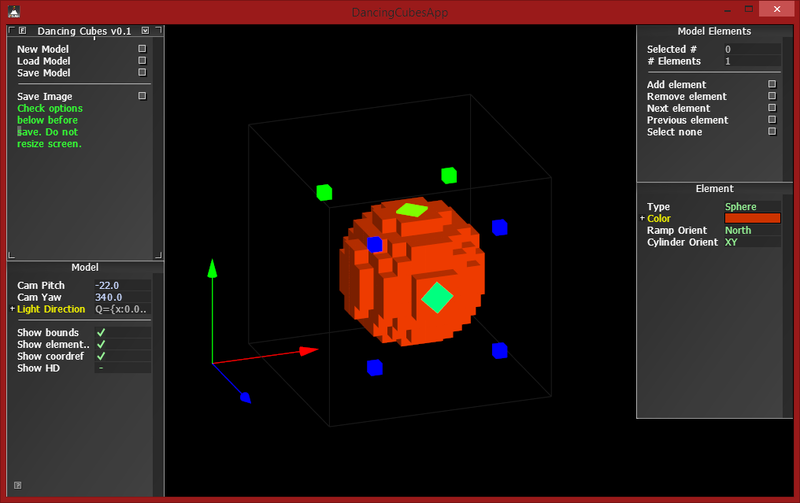 May I present you the first release of Dancing Cubes, a tool for making voxel art, available for Windows. With the tool the artist may build models to make tiles in 2.5D or models with voxel art, using basic constructions blocks. It’s available in itch.io, where you will be able to download it. The tool is based in the prototyping challenge proposed by Daniel Cook in his blog [Lost Garden](http://www.lostgarden.com/2013/10/prototyping-challenge-3d-modeling-tool.html). The program still has many rough edges, but I appreciate your feedback. Especially if you have used similar programs. @TheGagzu @chiguire Hola ¿por qué sus avatares son corazones?